The dream: What if you could easily organise your food and eat really well, arriving at camp after a hard day of adventure and enjoy a fantastic, easy to prepare meal. The reality: Eating 2 minute noodles, mac and cheese or stodgy freeze dried food every day until you feel sick. What if you could get a stack of different ideas to take great food on your next trip? Food that tastes great, is as simple or gourmet as you want, food that is lightweight and really easy to prepare at camp? 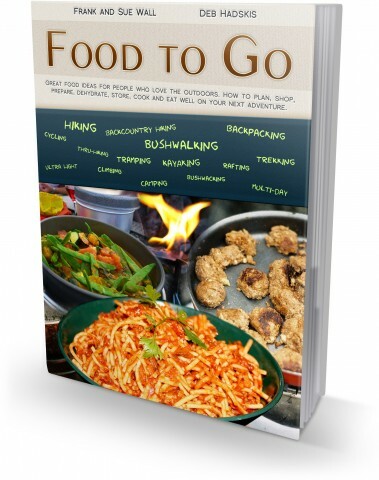 Food to Go is an eBook designed to give you the skill and inspiration to take great food on your next adventure. Created by experienced multi day hikers it is packed with tips and ideas to make shopping, planning, storage, packing and cooking meals easy. The great thing is it includes menus from 14 experienced bushwalkers and backpackers from across the world. They have shared their food ideas, recipes and menu planning tips to save you time and effort. – international contributions that introduce food ideas I wouldn’t have considered. It’s easy to stay with the same old recipes and menus that we have been using for years. The trouble is, they are boring. I’m looking forward to trying out some new ideas including dehydrating food which is something I’ve never really got into in the past. This 160 plus page downloadable PDF eBook is written with the beginner in mind but will also give experienced multi day hikers new ideas that work. 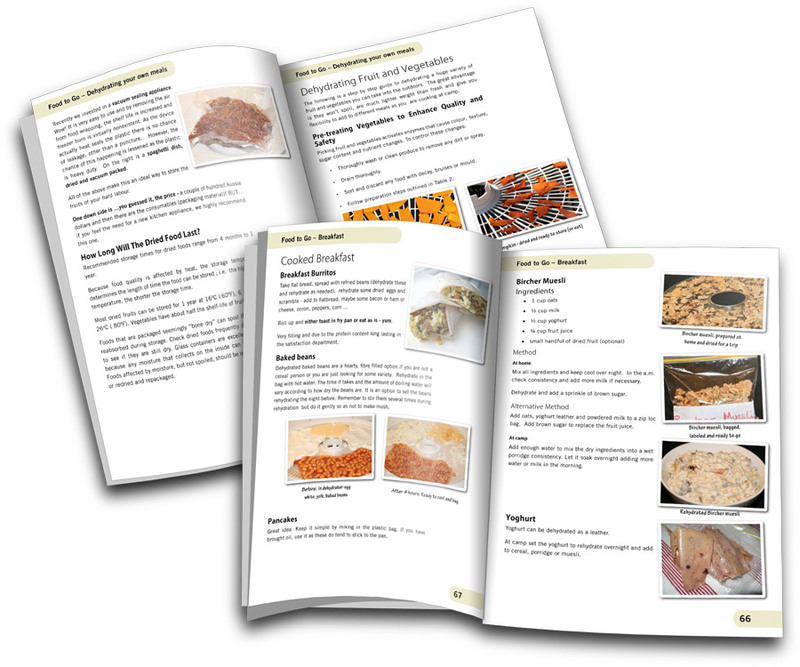 We have sourced ideas and recipes from many experienced people and created a fantastic information package to make it easy for you to get food organised for any outdoor adventure. We want the book to speak for itself so just click on the picture below and the sample will open on your screen. Please contact us by email frank@ourhikingblog.com.au. We have helped out many people since the book has been released, it is not a problem. Let us tell you more about it in this short (pre-release) video, or read on. Why are we so proud of this eBook and believe you won’t leave for your next trip without reading it from cover to cover several times? Because it’s huge – 160 pages packed with a huge spread of different topics and ideas never seen in one place before. 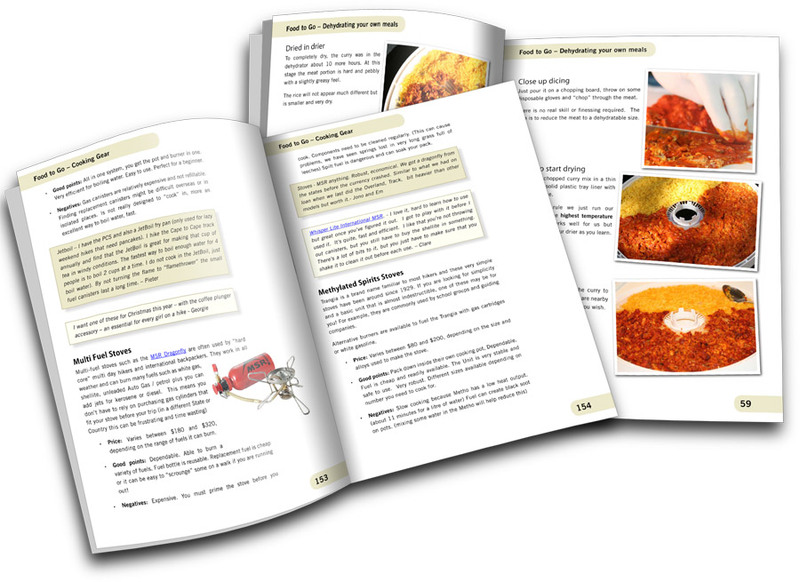 Because it’s practical – there are step by step guides, tips and tricks and over 60 recipes anyone can prepare. 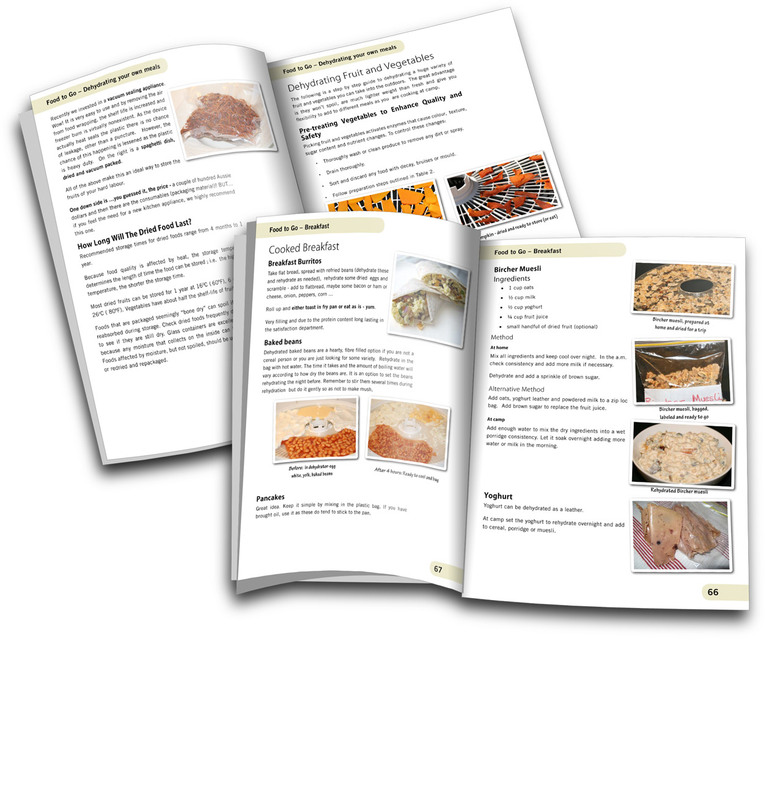 The guide on how to dehydrate almost anything, even your home cooked meals, is over 15 pages alone. Because it’s easy to read – we have kept the information clear and easy to follow. Broken into easy to read and logical sections, the book guides you through every step from planning your menu to cooking great meals at camp. Because it’s easy to use – As an eBook it’s easy to read on your computer or reader, search for different ideas or navigate around the chapters. You can also print out the whole guide or just sections to use or read later. Because it’s for everyone – don’t have time to cook or dehydrate food? No problems, there are guides to the best supermarket, store bought or pre packaged meals. Even a whole four day menu you can just buy off the supermarket shelves. If you are looking for new ideas that will impress your friends choose from 40 different main meal options. Let us teach you how to take great food on your next trip. 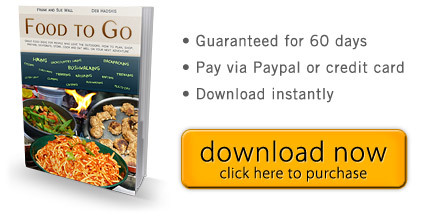 Food to Go is made up of several guides all packaged into one easy PDF. Detailed close up photographs that answer your questions. Vegetarian and meat eaters will love the range and choice. Store bought – in too much of a hurry to cook? Check out our list of pre-packaged meal options available across the world. Read what other’s have said about their experience with freeze dried food, the good, the bad and the horrible. Check out our scroggin recipe, GORP like you have never seen before. Learn what we take for great snacks on the track. Want some Bliss Balls? They will blow your socks off! Burners and cooking gear – what’s the best to buy? Compare lightweight stoves, all in one place, and decide what is the best one for you. Get simple ideas for your camp kitchen including what to take or what to leave at home. For a full table of contents click here. Frank and Sue Wall have been enjoying great food on their bushwalking adventures for the last seven years. Through their Hiking Blog they have shared many simple ideas and menus from their multi day trips. They love eating great food that is simple to organise, lasts the distance and is light weight. Deb Hadskis has backpacked in North America, New Zealand and Australia. She loves preparing tasty food and has cooked and tested most recipes in Food to Go. She is also responsible for the beautiful photographs that highlight many of the recipes in the book. Fantastic work! Where did you pool all that information from? I’m definitely going to be trying some of these ideas. I likes it a lot. And the timing is great for me, as I need to start getting food dried for our next walk. Although I’ve been dehydrating food a lot in the past, my repertoire has been very limited, and I’ve been nervous about expanding it due to a spag-bog disaster one time that just put me off the whole business. I’m hoping that familiarising myself with your tips will give me the confidence to expand my dehydrating skills and menus further. If you are not satisfied that Food to Go has not helped you with recipes and meal ideas for your next adventure then just let us know and we’ll refund your money in full. That’s how confident we are this resource will help you prepare great food. Food to Go is ready for your download right now for $A9.99 – to secure your copy simply click the “Download it Now” button below and you’ll be taken to the page where you can make your payment via Paypal or Credit card and get immediate access for download.